Grease build-up can cause hood fires to start and rack up thousands of dollars in damage, like at this restaurant in Charlotte. Oil containers also present a huge risk for devastating fires at restaurants. Take, for example, what happened at this beloved eatery in Downtown Tacoma, WA recently. Happy Teriyaki #4 caught fire when an outside oil canister caught fire and spread into the restaurant. The Internet of Things (IoT) allows you to keep tabs on all of your machines and control them with a few taps. You can monitor your oil levels and quality, for example, with Restaurant Technologies. Oil filtration is a huge component for not only food quality, but for safety of your employees and establishment. Along with technology comes the ability to automate tasks that used to take time and put messy and dangerous jobs in the hands of your kitchen staff. Instead, Restaurant Technologies allows for automation. Whether it’s continuously cleaning your restaurant hood with AutoMist, or automating the delivery of new oil (and disposal of old) with total oil management, automation will make your kitchen more efficient, safer and smarter. 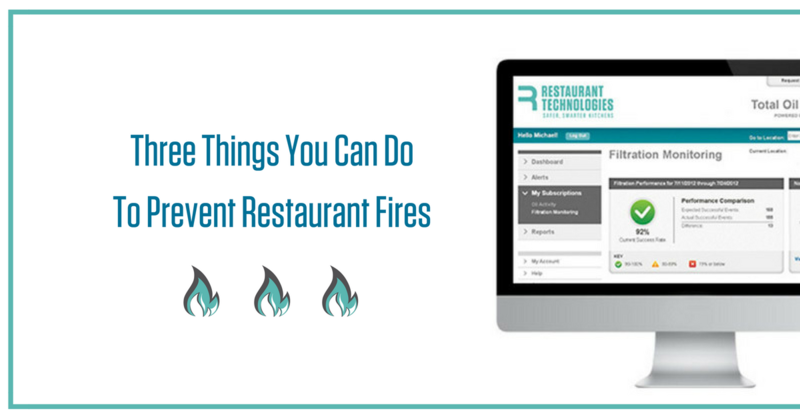 No matter what you fry and cook, your restaurant deserves the best in technology and automation to ensure safer and smarter kitchens. To learn more, visit our total oil management and AutoMist solution pages. Learn why over 25,000 restaurants, and foodservice operators use Restaurant Technologies with a zero-obligation on-site survey. An oil management specialist will help you evaluate if Restaurant Technologies is right for you! Special Notes, Requests, or questions?